At the annual meeting in 1894, a committee was appointed to attend to preparations for having an outing at Highland Park, Avon, during the summer of 1895, but through an oversight the gathering did not take place; consequently at the next annual meeting, to make success doubly sure, President Daniel Huxford was made a committee of one to carry same into effect. The day appointed for the outing was Aug. 4, 1896. The news was heralded about the many towns, and the day opened up bright and warm, just such weather as people generally choose for picnicking. Many an eye sparkled and many a heart throbbed with joy at the prospect in view, and the result of the coming together of the old members of the Old Stoughton Musical Society. President Huxford and Chorister Mann were on the grounds at the appointed hour, seeing to the arrangement of seats for 400 singers. The place designated for the sing was located in the eastern part of the grove, on the side of the hill, at the foot of which was a covered stage for the use of the Park performers, who gave nightly concerts. The location, while it was good enough for a happy-go-lucky audience, was not wholly fitted for the use of a large chorus. At the appointed hour, Leader Edwin Jones had placed his orchestra upon the stage, where Mrs. Georgia M. Howard presided at the piano. As the electric cars arrived, the singers wended their way in and took their places, until the space allotted was full and no more could get in, while listening thousands stood around to hear the welcome songs. At 1:15 P. M., Chorister Nelson Mann started the sing with the usual old familiar tunes, Chester, Invitation, Majesty, and others. The sing was very informal, each one having the privilege of calling a number, should they choose to do so, and many improved the opportunity, as there are many favorite tunes in the Old Stoughton Musical Society's Centennial Collection, which have a snap and a melody that give the highest pleasure. At the earnest solicitation of friends, Mr. Alanson Belcher of Stoughton, in his 86th year, was invited to assume the baton and conduct the chorus through several tunes, which he did most successfully. The song of the afternoon was sung by Mrs. Marie W. Fobert of Rockland, with piano accompaniment by Mr. E. A. Jones. Her first selection was "Nevada Waltz," which was so heartily cheered that she responded with a song of her own composition, and sung by very high artists. Mrs. Fobert was a beautiful singer, and good critics spoke highly of her efforts on that occasion. The program ended with the singing of America by the chorus, the multitude joining. Among the great sea of faces that looked down upon the Chorister and orchestra were ex-Chorister John B. Thayer of Randolph, ex-Chorister Leander Soule of Taunton, ex-Secretary-Treasurer Dr. Charles C. Farnham of Randolph, Lucius H. Paine, Holbrook; Richmond T. Pratt, Holbrook; Washington Paine, Holbrook; Josiah Clark, Randolph; Prof. I. M. Foye, Middleboro; Elijah G. Capen, Stoughton; Lawyer White, North Easton; Samuel L. Crane, Avon; Daniel B. White, Randolph; Isaac French, Holbrook; Warren Porter, Brockton; James Allen, East Braintree; ex-Mayor Albert R. Wade, Brockton; Edward Hobart, Braintree; Hon. James T. Stevens, South Braintree; Hon. Charles F. Porter, Brockton; L. Morton Packard, Brockton; Mace Gay, Brockton; George Packard, Brockton Heights; K. R. Clifford, Luther Porter, George Capen, Isaac Capen, Stoughton; and a host of others. The Brockton Enterprise was represented by Reporters John T. Doyle and E. S. Thompson; the Brockton Times by Miss Gates; and the Stoughton Sentinel by Editor Lemuel W. Standish. The second annual outing and sing of the Society was a most enjoyable event. It was held August 31, 1897, being postponed from August 24th on account of rain. Seats for four hundred had been roped off directly in front of the stage, and promptly at 1 o'clock, President Daniel H. Huxford of Randolph called the members to order. He read a list of twenty-four papers which had extended courtesies to the organization in the shape of press notices. They included the leading dailies throughout this section. A motion was made to extend a vote of thanks to these papers, which was carried unanimously. He then introduced Chorister Mann of Randolph, and Mr. Edwin Jones of Stoughton, who was leader of the well trained orchestra. The members of the chorus were given the privilege of choosing their own selections, and Chorister Mann took his place, rapped for attention, raised his baton, and four hundred voices rose in the opening selection, "Majesty." Other old tunes followed and a song, "Sleep-On," that was very popular about 60 years ago, was rendered by the request of a member of the chorus, and the quartet which rendered it consisted of Mr. Frank A. Atherton, tenor; Miss Bessie Kelsey, soprano; Mrs. E. A. Jones, alto, and Marcus M. Porter, bass. All of these members were from Stoughton and the rendition of the song was loudly applauded. Miss Bessie M. Kelsey was the only soloist of the afternoon, and at this point sang Sinclair's "Come Sit Thee Down," a song that was very popular about a half century ago. Miss Kelsey had a beautiful soprano voice, which rose sweet and clear, being distinctly heard by the entire audience. The grand old hymns were never heard to better advantage than when they came forth from the thousands of voices assembled together in the last two numbers, "Coronation" and "America." 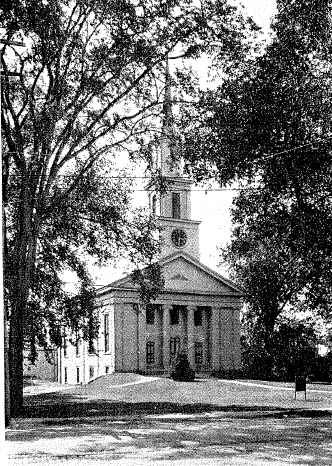 Among those present were Dr. T. H. Dearing, Braintree; Leander Soule, Taunton; Charles F. Porter, Brockton; Alanson Belcher, Stoughton; Dr. C. C. Farnham, Randolph; James S. Allen, Bridgewater; L. Morton Packard, Brockton; Leander Curtis, Rockland; E. A. Jones, Stoughton; John B. Thayer, Randolph; Sanford W. Billings, Sharon; Elijah G. Capen, Stoughton; Lewis Porter, Brockton; Cornelius Faunce, North Abington. Among the ladies were many prominent soloists, viz: Mrs. T. H, Dearing, Braintree; Mrs. C. C. Farnham, Randolph; Mrs. Elijah G. Capen, Stoughton; Mrs. A. C. Whitmarsh, Whitman; Mrs. Dean, Brockton; Miss Mary E. Morton, Stoughton; Mrs. Elizabeth B. Battles, Brockton; Mrs. Edwin A. Jones, Stoughton; Mrs. Horace A. Bird, Mrs. Randall, Brockton, Mrs. Babcock, Brockton. Mrs. Babcock was one of the oldest members of the Society, being 84 years of age, and had for years been a member of the Handel-Haydn and' other prominent musical organizations. The third Summer Outing was held August 30, 1898, but no detailed account can be found concerning its activities. The fourth annual outing of the Society was a grand success and highly appreciated. The morning of Tuesday, August 29, 1899, was of such a nature that singers did not know whether the rain would fall or the weather be clear, thereby keeping many at home who had made arrangements to attend, at Highland Park. As it was, the sun came out clear at noon and though fog obscured it later, a chorus of about two hundred and an audience of about three thousand assembled in the seats and sang the songs of their fathers and mothers with more than ordinary pleasure. The singers came from Abington, Avon, Braintree, Brockton, Canton, Holbrook, Milton, Randolph, Sharon, Stoughton, Weymouth and other towns. It was quite 1:30 P. M. before ex-President Daniel H. Huxford of Randolph, the committee of one in preparing for the outing, called the chorus to order for the purpose of congratulating the Society and expressing his thanks for many courtesies received. At the conclusion of ex-President Huxford's address, Chorister Mann took charge of the chorus and Secretary Edwin A. Jones, of Stoughton, became director of the orchestra of twenty pieces, while Mrs. Georgia M. Howard presided at the piano. Many of the old tunes were sung, but the full programme was not carried out for the want of time. A feature of the outing was the singing by the Randolph Male Chorus, which won so many golden encomiums from strangers, as well as friends, that it is indeed flattering to even think about them. The chorus—First Tenors: Frank W. Crane, Charles H. Clark, Michael F. Boyle; Second Tenors: Eugene C. Kinsley, Charles H. Wilde, Nelson Mann; First Basses: John R. Jones, H. Joseph Shepard; Second Basses: Daniel H. Huxford, Farrell Cain; William F. Barrett. They sang, with splendid harmony, "We Come With Songs to Greet You," "Swell the Anthem," "Going Down the Valley," and "Heavenly Highlands" (as a memorial to the deceased members) "Star of the Evening" and "Sweetly, Sweetly Sleeping." The solo, "Only the Sound of a Voice," by Mr. John R. Jones was finely sung, while Mr. Charles H. Clark acted as piano accompanist. The applause was so great that Mr. Jones sang "The Armorer's Song" from Robin Hood in a brilliant manner as an encore. The last selection, "The Soldier's Farewell," was sung by the Male Chorus and the tenors and basses of the Society, with fine effect, Chorister Mann directing. The Brockton papers were unanimous in praising all who took part in the outing, and considered it one of the most enjoyable and pleasing musical successes of the year. Owing to lowering skies, that threatened every moment to rain, many of the old timers were kept away from the Summer Outing at Highland Park, Tuesday, August 14, 1900. About one hundred members of the Society gathered. They dispersed under a smiling sun that shone clearly in a blue sky that seemed guiltless of ever harboring a drop of moisture. The sun did not appear soon enough, however, to be of much use in increasing the attendance. The exercises, which had been set for 1 o'clock, were late in starting, allowing all a chance to search out old friends and renew acquaintances. The fame of the Society's out-door sing attracted a large audience and before the close of the programme there were few empty benches. Remarkable, sturdy and fresh-faced were many of the old people, and the steadiness and strength of their voices were commented upon by the onlookers. The exercises began a few minutes before two o'clock, enough time to ensure the success of the choruses. The singers, with their books under their arms, took seats in front, the different parts sitting together. Mr. Edwin A. Jones, of Stoughton, led the orchestra and Nelson Mann, of Randolph, acted as conductor. Mr. W. F. Burrill, of Brockton, presided at the piano. In this musical programme, as prepared, there were two disappointments. Dr. George R. Whitney, of Haverhill, formerly of Brockton, was down for a 'cello solo. He was present, but found the air too damp to play a stringed instrument successfully. Dr. Whitney was a clever improvisor, and was always entertaining. Miss Goullard, of Braintree, who was said to be a superior soprano soloist, had been engaged to appear, but the weather looked so threatening that she sent word she did not dare to use her throat in the open air^ and so could not be present. With these two exceptions the programme was given as planned. After the sing in good style of Majesty and Chester, two selections from the "Centennial Collection," Mr. Mann gave way to the president of the association, Dr. C. C. Farnham, who was down on the programme for a speech. Dr. Farnham stated jocularly that he had a carefully prepared speech laid away in his pocket but owning to the lateness of the hour he would not unload it upon the audience. He knew that they had all come to sing, and sing the old tunes, a field which the Old Stoughton Musical Society had all to itself. He gracefully introduced, as the speaker of the afternoon, Capt. Frank N. Scott, of Boston, a grandson of William Billings, the father of American composers. Capt. Scott read a very thoughtful paper that treated exhaustively of the life and work of his talented ancestor. Of Billings' descendants, up to this time -10 children and 40 grandchildren - none may be said to have inherited their ancestor's talent for music in any marked degree. Mr. Billings was a personal friend of Governor Samuel Adams and Dr. Pierce, of Brookline. The speaker summed up the work accomplished by the first American composer and said, "He elicited a musical spirit that gave to New England an impulse that is felt to this day. He may be justly styled the Columbus of American music, for his was practically a voyage upon an unknown sea in quest of a new world of song - and on a sea, too, of which he had taken no soundings". Following the paper by Capt. Scott, a treat was furnished the audience in a baritone solo by Fred S. Sprague, of Brockton, accompanied by Mrs. E. P. Blake. Mr. Sprague was heartily encored and given a place further along in the programme, when he was again greeted with enthusiastic applause. About a dozen choruses were sung with a vim and harmony that were surprising to those of the younger generation, who were present. The exercises were brought to a close by the whole audience standing and singing "America" in a manner to set the blood tingling. Among the members present were Elijah Capen, Marcus Porter, Mr. and Mrs. E. A. Jones, H. W. Darling, K. R. Clifford and George Ellis Bird of Stoughton; Dr. and Mrs. C. C. Farnham, Joseph Belcher, Daniel H. Huxford, Lucius Clapp, Mr. and Mrs. Nelson Mann, Mrs. Frank Tileston and A. W. Howard of Randolph; Charles F. Porter, Lewis Porter, Mr. and Mrs. W. F. Burrell and Mrs. Dean of Brockton ; Dr. Dearing of Braintree, C. A. Faunce of Rockland, Dr. Whitney of Haverhill, Mr. and Mrs. Allen of Bridgewater, Frank Crane of Avon, Mrs. Fish of North Stoughton, and Leander Soule of Taunton, and Mrs. G. Jaquith, Frank Perkins, Mrs. Randall, Miss Nettie Howard, Mr. and Mrs. L. Morton Packard and Mrs. Melvin Clark. 6th Annual Outing, August 27, 1901. The Society held its annual outdoor singing meeting at Highland Park and it was one of the banner days in its history, being exceptionally well attended and highly enjoyable from every point of view. A large number of the towns and cities of Norfolk, Plymouth and Bristol counties were represented by attendants, and some came from more remote sections. Brockton, Randolph and Stoughton were in the majority. One of the leading spirits of the day was the Society's president, Dr. Charles Farnham, of Randolph. He was on hand early, welcoming members as they came, and so was Mr. Nelson Mann, of the same town, who led the singing. The orchestra, consisting of a dozen well known musicians of this section, was directed by Edwin A. Jones, of Stoughton, who was Secretary and Treasurer. One of its members had a bass viol, which he said was presented to him by his father, forty-nine years ago. This was Mr. George Ellis Bird, of Stoughton. Others who played instruments were Mr. William A. Bowles, of Whitman, Mr. Al. 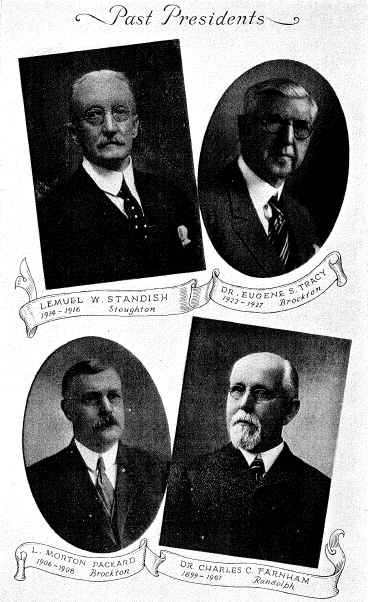 Doten, Mr. Arthur C. Gardiner and Mr. Holmes, of Brockton, and Mr. E. A. Jones, of Stoughton. Mr. Nelson Mann, the singing conductor, occupied a raised platform between the orchestra and the singers. These to the number of 150 or more occupied the front rows of seats on the right of the stage. The selections were all from the "Centennial Collection" and were well sung. The soloist of this occasion was a young lady, Miss Fanny Buck, of Stoughton, who sang, in a charming manner, "Life Is All a Dream" and won the plaudits of all. One of the interesting visitors of the day was Mr. George F. Daniels, of Boston, president of the second oldest musical organization in the country, the Handel and Haydn Society. Mr. Daniels made a brief address. He took occasion to congratulate the Society on the excellence of its singing at the meeting and for its glorious history, and to extend to it the warmest greetings of the society he represented. Although most of the singing was done by middle aged and old persons, there were also quite a number of young persons, who took part and added to the harmony of the "sing". Fair maids were not wanting, and their voices were raised with excellent effect. The "sing" lasted from 1 to 3 o,'clock. 7th Outing, and Last at Highland Park, August 26, 1902. The day was a fine one and the three hundred members of the Society who met on this occasion seemed to share in the spirit of the time. President Edwin A. Jones presided with his usual grace and directed the orchestra of fifteen pieces. Choristers Nelson Mann and Cornelius A. Faunce each in turn conducted. Mrs. Georgia M. Howard presided at the piano. Mrs. Marie Fobert introduced as soprano soloist Miss Alice Delano, of Rockland. Miss Delano sang ''Rose of My LifeV and as an encore, "Life's Lullaby." Mr. B. C. Faunce, of Abington, sang "The Indifferent Mariner" and on recall gave "Asleep in the Deep." Secretary, Dr. Charles C. Farnham. This was the last of these annual outings, for two reasons, at least; that there had been many deaths of the older interested members, together with changes made in the Park. The woods, which had previously afforded shade during the very hot days in August, had been cut, thus leaving the singers and audience unprotected for two or three hours from the intense rays of the sun.